Luke Juran with Sangeeta following her surgery. When Fulbright U.S. Student Luke Juran met Sangeeta, he was conducting research and collecting data from post-tsunami villages in Tamil Nadu and Pondicherry in India. At six years old, Sangeeta was shy at first, and did not come out to meet him until he called to her to join the discussion. When she joined the group, Luke realized that the reason she was so reluctant was because she was suffering from a severe cleft lip and palate. Cleft lips and palates are acute deformities that occur within the womb and that can lead to difficulty breathing, eating and speaking. In many cases, remedial surgery is simple and effective, but sometimes getting that treatment in rural parts of the world can be extremely difficult. “I knew that I was expected to leave an indelible impact on the villages in which I conducted my research,” says Luke. He decided the best way to leave a positive impact on this community was to help Sangeeta. 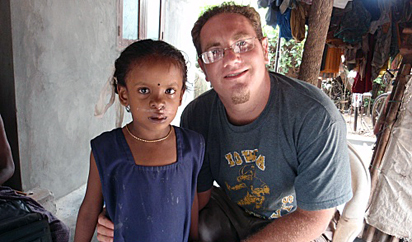 Luke consulted Sangeeta’s family and Smile Train, a nonprofit that provides free cleft-lip and palate surgeries to children around the world. Soon, Sangeeta and her mother were on a bus to Madurai, where Sangeeta underwent the corrective surgery. Soon after, Luke met Poornaprakash, a six-year old boy suffering from a severe cleft palate - so severe, that he was unable to speak at all. Once again, Luke stepped in and helped arrange corrective surgery. Luke’s interest in relieving the burden of cleft lips and palates continues. He is working with the Meenakshi Mission Hospital and Research Center and Smile Train to arrange a screening camp in Nagapattinam and Karaikal so officials can identify cases, provide counseling, and schedule remedial surgeries.